A 3-year-old boy died after being struck at the intersection of L and East Sixth streets. 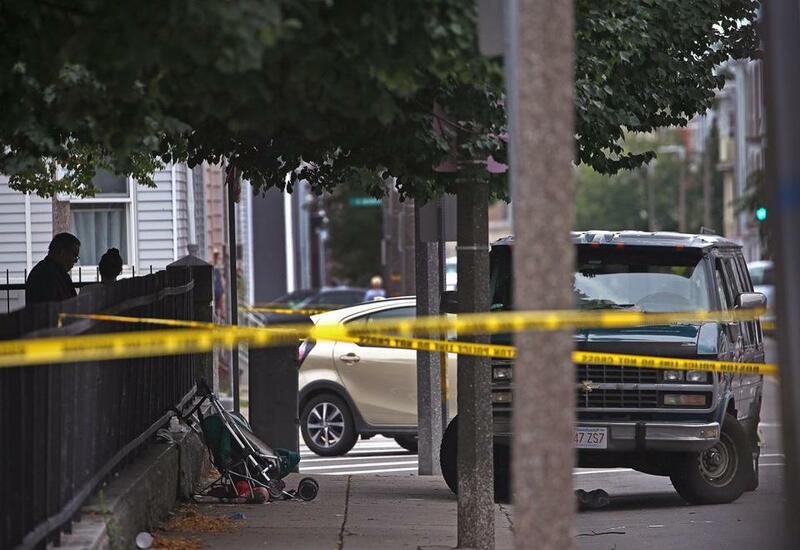 A 3-year-old boy was killed and his 4-year-old sister injured when a van struck their stroller along a sidewalk in South Boston Wednesday afternoon, authorities said. The woman pushing the stroller was not injured in the chain-reaction accident at the intersection of L Street with East Sixth Street. Police Commissioner William B. Evans called the crash a “terrible tragedy.” “It’s everybody’s worst nightmare,” he said at the scene. The crash occurred shortly before 3:15 p.m. A van and another vehicle collided, which caused the van to hop the curb and strike the children in a stroller, Evans said. The drivers of both vehicles stayed at the scene, he said. Evans said it was not immediately clear if the woman pushing the stroller was the mother of the children or a baby-sitter. “She’s obviously very shaken up,” Evans said. In the middle of the intersection, which was cordoned off with police tape, a beige four-door car with front-end damage was stopped. A Chevrolet van was nearby, with one of its tires on the curb. On the sidewalk, investigators took photos of what appeared to be a mangled stroller. Evans said police were canvassing the neighborhood for witnesses and checking for video surveillance footage. “Our hearts go out to the parents,” he said. The victims were not identified; Evans said the girl is expected to survive. At the scene, City Councilor Ed Flynn, a South Boston resident, also offered condolences to the family, which he said lives in the neighborhood. “It’s a tragic, awful day in our community,” he said. The crash drew several residents to the scene, including a man who said he saw the crash. The witness was driving home from work on L Street, going south toward the beach, when he stopped to allow a woman in a car on East Sixth Street to proceed. He said he made eye-contact with the woman and waved her through. The woman was nudging her car into the intersection when the crash occurred, he said. A van travelling north on L Street, toward East Broadway, crashed into the car, he said. He described an emotional aftermath. Passersby tried to perform CPR on an unconscious boy, he said. The woman who was pushing the stroller was screaming, he said. A man held the injured girl. He said he wished the car would have hit his vehicle. “That way the kids wouldn’t have gotten hit,” he said. A 39-year-old neighborhood resident who identified herself only as Kerry said she often walked up the stretch of L Street at the site of the crash. Tammy Gladney had just started her shift as a waitress at L Street Diner when she heard a loud screech. She looked out the window of the diner, located about a block away from the crash, to find a hectic scene. “Ambulance, fire trucks, cops were here within minutes,” she said. One resident said speed is a persistent problem on that stretch of L Street. “This street is insane,” said Robert Henry, a 70-year-old retiree. Henry said some motorists use South Boston, and L Street in particular, as a way to circumvent Interstate 93. As he sat outside a laundromat on L Street, Joseph Miles, 52, a lifelong South Boston resident, agreed speed is a problem. He would like police to issue more speeding tickets in the area. “That’s the only thing people seem to understand,” he said.